Exploring the game's depiction of religion. There is a long history of religion in games, and RPGs provide a good space for conversations about faith that could have felt flippant in other genres. In The Witcher 3, religion is more than just window dressing. Set in a world outgrowing magic, the game depicts religion in varied ways: tackling philosophy, corruption and misconception, while allowing room for players to interact with gods, decide peoples' fate and support or condemn religious practices. Geralt's own beliefs, or lack thereof, are notable, as he must regularly interact with religious characters. Geralt is magical, yet likely wouldn't describe himself as a magic user, and has a distaste for certain elements of the practice. Despite this, Geralt can be played as a supporter of religion (and his aversion to magic isn't so strong that he wouldn't date a sorceress or two). Magic is often used as a way of portraying seemingly religious rituals within games. Think of Yuna's summoning of the spirits of the dead in Final Fantasy X, or the magic used to resurrect characters in World of Warcraft. Magic rituals are performed repeatedly in Skyrim, another game that, similar to The Witcher 3, uses standing stones as a source of power. The Witcher 3's own Places of Power are quite similar to those we see today at Stonehenge or Avebury. Also of note is that Geralt recharges himself by meditating. While meditation today does not have to be directly linked to religion or belief, meditation has been a core aspect of multiple religions, from Buddhism to Christianity, since ancient times. Geralt's relationship with religion and faith is a constant foil to his character, a reflecting point that the game repeatedly dwells on. The Witcher 3 repeatedly asks us what we believe by challenging Geralt's own beliefs. The Witcher 3 presents us with many different forms of belief. The Church of the Eternal Fire, for instance, is depicted as civilised but corrupt, operating with near-medieval cruelty. For the Church of the Eternal Fire, religion is all about appearances. Sitting at the highest peak of the city of Novigrad, in a wealthy neighbourhood, the church is ever-so-subtly painted gold. You can't go into the building yourself, so there's no way to know what kind of rituals go on in there. By separating the church itself from the player, the organisation gives off a feeling of inaccessibility. It's clear that Geralt isn't welcome, and if the multiple scenes of people burning at the stake for being magical don't get the point across, the sneering remarks of the rich churchgoers do. It’s telling that the majority of quests in which you interact with members of the Church of Eternal Fire are negative. There's corruption, fanaticism and racially-motivated murder, not unlike the Crusades carried out by the Roman Catholic Church in the Middle Ages. 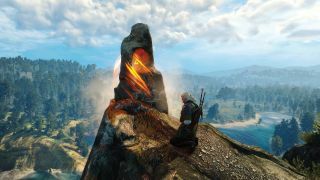 A roadside priest tasks Geralt with burning the bodies of dead soldiers in one of the first quests to include the Church. On the surface, this seems like a standard 'go here, do this, come back for a reward' quest. However, when one of the bodies turns out to be not quite dead, it's revealed that the priest is actually getting you to burn the evidence of his illegal fisstech trade. If you confront the priest and refuse to accept his bribe to look the other way, you're forced into a three-on-one fight, but with a larger reward if you win. Maybe this is the game suggesting this is the ethical choice to make, but the implication is the same: corruption and organised religion go hand in hand in the world of The Witcher 3. Quests that revolve around folklore are more open-ended. In Velen, rituals are common roadside occurrences, frequently featured in quests that ask you to protect people during acts of worship, or participate in them yourself. The corruption of the church of Yevon forms a large part of FFX. Despite being a religion most of your party follow, it's revealed to be a sham. Also, there's a giant whale called 'Sin' who turns out to be the protagonist's dad. Religion is a central theme, with the choice between refusing or accepting hero-worship left up to the player. You can believe that you have been chosen to save the world, but, as the game lets you know, you haven't. In the wasteland, religious belief doesn't get any stranger than the Children of the Atom, a cult which worships atomic bombs. These zealots like to expose others to the 'Glow', also known as face-melting nuclear radiation. In 'A Greedy God', Geralt comes across a destroyed building which is now the site of worship for a local deity (imaginatively called the Allgod). Villagers are complaining that the Allgod has cursed them for not providing adequate offerings. With a little digging you discover that the assumed deity is actually a sylvan living in a cellar underneath the worship site, greedily scoffing the villagers’ offerings. Sylvans are traditionally woodland spirits or deities—relations to the Roman god of woods and fields, Silvanus (not to be confused with the Blizzard character of a similar name). This quest is often described as funny, yet your options for what to do once you've discovered that the deity is a monster scamming his way into obesity aren't great. If you kill the sylvan, you gleefully tell the villagers that you have righted the wrongs against them. They were being fleeced after all, and now they’re free! The villagers react badly to this—they think they’ve been doomed and rush off to organise a group prayer session. If you tell them to check the cellar below, you'll later discover they followed your advice, confronted the sylvan, and are now all dead. The only way to please both parties is to threaten the sylvan but not kill it, effectively maintaining a lie, but keeping everyone alive. The game doesn’t comment either way, so we're left wondering: is that a positive result? Have you saved anyone or really achieved anything? Does Geralt even care? In 'Defender of the Faith', Geralt is asked to fix a series of shrines that have been vandalised. There’s little reason for you to actually do this quest—it doesn’t add to the overall story of the game—but as Geralt is told by the villager who hires him, if he doesn't help out, the local children will grow warts and the dogs will get the mange. Geralt doesn't want to go out of his way, and that's understandable for a man with a policy of 'live and let live' when it comes to religious practices. And besides, this isn't strictly Witcher-work—he's not a religious repairman. As it turns out, though, the true villains of this quest are the worst monsters of all… students from Oxenfurt Academy quoting Nietzsche and Marx ("Religion is the opiate of the masses!"). It's clear that Geralt thinks this is a waste of his time. "Sheesh, students!" he exclaims, rolling his eyes. Yet he never truly condemns the belief aspect of this quest. Here we get to see both extremes of an argument about faith: from an elderly woman who believes that wooden shrines will ensure good health, to students who think destroying said shrines will force the locals into a life free of superstition. This quest lays the foundation for a conflict that reemerges throughout the entire game: the pagan beliefs of down-on-their-luck villagers, against the more atheistic views of their well-off counterparts. Despite making a fantasy RPG about magic and belief, at times it feels as if CD Projekt Red thinks the majority of its audience are sceptics. Stories of villagers sending their children to mysterious witches in the middle of a swamp, in the hope it will bring them good fortune, are presented as being wildly superstitious. The Ladies of the Wood are at the heart of one of The Witcher 3's most beloved series of quests, presented as a terrifying reality in the shape of an old wives' tale. The fact that the Ladies are proven to be horribly real, and that they eat children while dancing naked around a cauldron, feels like a smack in a doubter's face. The Witcher 3 does this time and time again: showing us something completely fantastical, allowing us to revel in doubt and suspicion, before pulling back the curtain and revealing it all to be true. Geralt is often sceptical of the problems he's brought in to solve—"A ghost is ruining our water supply!" "A villager has turned into a werewolf!" "The witches in the swamp are eating children"—yet they're all real. It's as if we’re being told to look closer into what we assume is the stuff of fairytales. By comparing the natural wildness of pagan belief with the rigid cruelty of organised cults, we're being shown that not everything fantastical is fantasy and not everything reputable is respectable. Despite having a sceptic for a protagonist, The Witcher 3 depicts religion in a surprisingly even-handed way. It portrays a medieval church that's clearly meant to resemble historical realities, and pagan belief systems that replicate both fairy tales and real-life rituals. We're never given a clear sense of who or what to believe, which unlike the many RPGs that have come before it, leaves the choice up to us.